A couple of weeks ago Marc Dos Santos gave an analogy about meeting a girl you like who has a cat that comes with her. There were no ifs or buts, this was the deal. You had to have the cat as well. But I’m now starting to think that the cat was black and that MDS accidentally ran over it. That’s surely the only explanation for the bad luck Vancouver Whitecaps have had to start their 2019 MLS season. 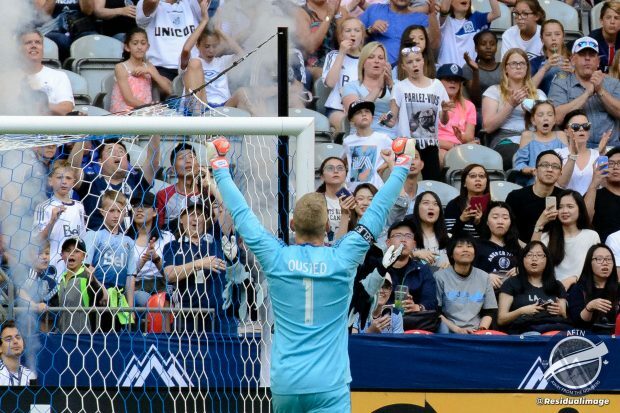 Another highly contentious decision, but one which will see former Whitecaps keeper David Ousted breathing a huge sigh of relief after his howler eight minutes into the second had allowed Vancouver to take the lead. After two scoreless matches at home, Dos Santos made three changes to the team that lost to LA Galaxy a week ago. Scott Sutter came in at right back after the poor showing of Jake Nerwinski, with Fredy Montero and Yordy Reyna coming back into the attack at the expense of Joaquin Ardaiz and Lass Bangoura. Would that rest they’ve had give the Whitecaps some new attacking impetus? Well, no. Far from it in the first half. In fact it was a half pretty devoid of any real goalmouth action from either side, with the only piece of excitement coming in the 31st minute when Chicago’s Aleksandar Katai was persistent in the box, before firing off a shot that a sprawling Maxime Crepeau tipped over. Goalless at the half, Vancouver’s attacking three had looked listless and isolated, with the midfield failing to connect with them or move the ball forward with any threat. This was still very much a game for the taking though for Vancouver if they could get any sort of offense going in the second half. It was Chicago who started the half stronger though, with Katai again coming close when he fired a low corner to the near post onto the roof of the net three minutes in. Then, from nowhere, Vancouver found themselves in front after a howler from their former keeper David Ousted. The Dane inexplicably chased down a ball across goal that he didn’t need to and as he slid dangerously close to carrying it out of the box, he tried to throw it away to Katai but it ran straight into the path of Reyna, who coolly slotted home into an empty net from a tight angle. It was a very composed finish from the out of form Peruvian. One we’ve seen many a player blast over in the past. Hopefully this will now spark something in the forward to get back to the form we know he’s capable of, or at least bring some consistency into his performances. C.J. Sapong fired one narrowly over on the hour mark, followed by a wilder one by Katai six minutes later, as the Fire tried to find the equaliser. Whitecaps substitute Joaquin Ardaiz gave us a glimpse of what he could be capable of with 15 minutes remaining when he bore down on goal and cracked one off the crossbar. Chicago were pressing for the leveller and it was leaving all sorts of room for Vancouver to try and exploit. But then, just as Vancouver took the lead from out of nowhere, they lost it again the same way. And to another penalty and to video review. Katai was in the thick of the action once again as his shot hit of what looked to be Henry’s chest in the box. There were a couple of light Chicago appeals, but play continued and the ball went out for a throw in. This was taken by the Fire but officials had asked for a review. One that resulted in a Chicago penalty, much to Vancouver ire and incredulity. None of the replays shows seemed to indicate a clear handball. In fact, they seemed to show the ball hitting Henry’s chest. After the match he said it his what was basically his shoulder. The referee disagreed, however, and Nemanja Nikolic stepped up to drill the ball home, making it 1-1 with six minutes remaining. There were no further goals, although Crepeau earned the Whitecaps a point with a point blank save from Sapong with two minutes remaining, and Vancouver were left still searching for their first win of the season and a feeling of having lost two points as opposed to gaining one. But there’s no time for the Whitecaps to sit feeling sorry for themselves licking their wounds. The games are coming thick and fast and perhaps the last thing the ‘Caps need right now is a visit from the best team so far in MLS, LAFC. A response is needed, but getting it won’t be so easy.